Keith Chatfield had the Impact Team of STAR Adult Services busy ringing bells for the Portsmouth Salvation Army Tuesday afternoon at Portsmouth Kroger. Pictured from left, are: Daniel, David, Chatfield, Jessica, Neal; back row: Tina and Tommy. The bells are ringing and the red kettles are waiting, as the Salvation Army continues their Red Kettle Campaign, for this season. Captain Dan Simco of the Salvation Army said the Star Impact Team has been working at Portsmouth Kroger ringing bells saying they will come about 15 or 16 times and ring for the Salvation Army. “They ring from 10 to 2 and they do a marvelous job,” Simco said. Captain Simco said they have many different groups that ring for them, clubs, high school groups, fire departments, Kiwanis, Rotary, individuals and a wide variety of folks that help them out. Simco said that so far, things are going well, but unfortunately this year, “we had one of the major places we were able to stand at last year, we weren’t able to stand as early as we wanted at that location. We wound up losing several thousand dollars worth of income that we raised last year, that we weren’t able to do this year.” He seemed to take that in stride as he said it is what it is. The campaign runs Monday through Saturday, they do not ring on Sundays and they will run up and through Christmas Eve. They have volunteer groups and they have some paid staff that will come and do the ringing. The paid staff that works, probably need the help during the holidays, he says. He says that even though they have to pay, its kind of a positive for them. Simco wanted to say thanks to the community for the support they’ve given and that they continue to give, it certainly helps them to do what they do, with the feeding programs, children and adult programs, as well as their emergency disaster response and rent and utilities assistance. This is how they use the money throughout the entire year in the community. Ding dong, ding dong, Christmas bells are ringing, as the Salvation Army is hard at work with their Red Kettle Campaign as it continues throughout the season. 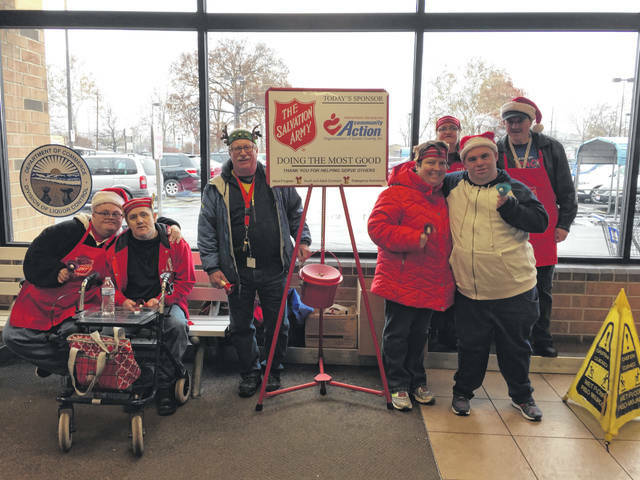 https://www.portsmouth-dailytimes.com/wp-content/uploads/sites/28/2018/11/web1_SA.jpgKeith Chatfield had the Impact Team of STAR Adult Services busy ringing bells for the Portsmouth Salvation Army Tuesday afternoon at Portsmouth Kroger. Pictured from left, are: Daniel, David, Chatfield, Jessica, Neal; back row: Tina and Tommy.